Helping with your serious injury claim is only part of our service. Helping you get your life back on track as quickly as possible is our primary aim. 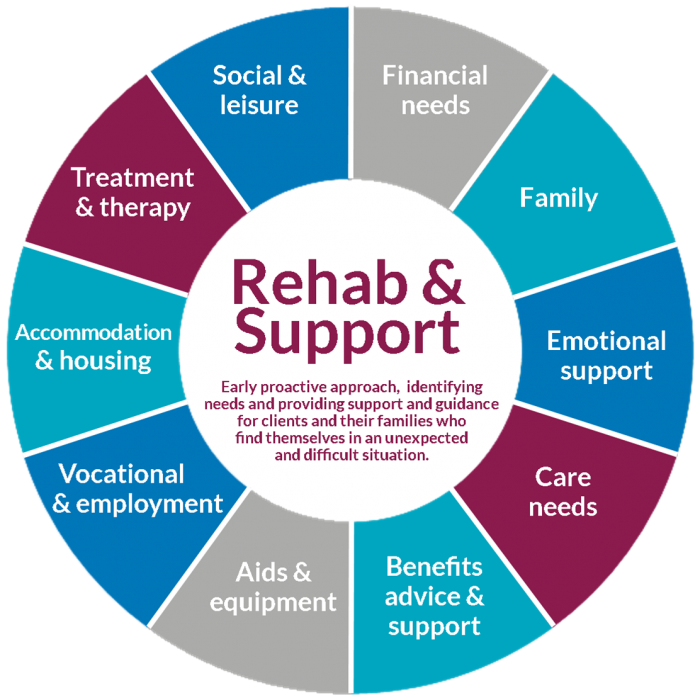 We will identify your needs and help access funding for comprehensive rehabilitation, support and treatment so that our clients have the best chance of rebuilding their lives more quickly. We take a whole-person approach to mental, physical health and wellbeing, enabling individuals to achieve their full potential. This support can be both in the hospital and after discharge home. We will listen and liaise with the clinical team and their recommendations and aim to help access funding to assist with your ongoing treatment and recovery. We speak to the relevant insurers at the earliest opportunity to seek their agreement to gain access to funding for early and comprehensive rehabilitation, including; Neuropsychology, Physiotherapy, Speech and Language Therapy (SALT) and Vocational Support, for example. In the meantime, our Clients Support Managers will help to provide support and access to limited funding to assist where needed. Following a serious accident, it may be necessary for you to have adaptations made to your home, or more suitable accommodation may need to be found longer-term. We will help to arrange housing modifications and adaptations or find appropriate alternative accommodation to aid discharge home and ongoing requirements. We can arrange for a detailed assessment to be undertaken at your home to set out what adaptations would be most beneficial to you and to help you get your life back on track. These adaptations can ease the transition of going home from a hospital environment, as well as help with your future needs. They can include even small adaptations, such as moving the height of the light switches or lowering worktops in the kitchen. We can help liaise with your employer, college or school and support you with vocational rehabilitation and return to work, college or school, for example. We can arrange an assessment to look at whether it is appropriate for you to return to work following your injury. This assessment will look into whether you are physically and mentally prepared to return to employment. If you are ready to return to work, vocational rehabilitation will help in finding appropriate work for you, as well as implementing any necessary changes and adaptations to your workplace. We will undertake a specialist assessment to advise on aids, specialist equipment and any adaptations that you can benefit from to help with your wellbeing, function and independence. These can include, for example, mobility aids, equipment, housing adaptations, wheelchairs, communication aids and assistive technology. We will assist and advise on benefits applications and support with appeals. We will help you and your family to establish what benefits could be available to you and assist with the application process. If these benefits applications are declined, we can help to support you through the appeals process. We will identify your needs and facilitate care packages. We will work with you to assess and obtain funding for the most suitable care package for you and your family. This can be both short and long-term care. If your family is also caring we can help with other aspects such as providing cover for sickness and holiday provision. Our solicitors are compassionate and from day one, our priority is to support you and your family and guide you through this difficult time. We will also assist with any emotional problems you and your family may be experiencing, including anxiety, low mood and depression and help to arrange therapy, counselling or other support to assist with your overall wellbeing. We provide all round support and expert advice for your whole family and support network. We will liaise with the whole family to provide all round support including helping with information on the injuries, liaison with the treating teams, helping with transport to the hospital and assistance with the discharge plans, for example. Your family’s needs will also be considered in relation to finances, child care, day to day needs and signposting to charities and other support services. We will address any immediate money concerns, for example, helping with travel expenses for the family, advising on bills and signposting to emergency funding and debt charities. We will always try to obtain interim (early compensation) payments to help with any ongoing financial pressures. As part of the claim, we will also claim for the losses and expenses you have incurred, and those that you are likely to incur for the rest of your life. These include, for example, increased living costs, loss of earnings, specialist holidays, ongoing care needs, technology requirements and other services that you may need. Your social wellbeing is also important and we will assess your needs and help with return to hobbies or other activities. Recreational therapy can be introduced to encourage you to be more active following your accident and to allow you to participate in social activities. We will also help with specialist equipment to get you back to sport, hobbies or other interests and activities that you want to continue to pursue. This can help with not only your physical fitness but also your mental wellbeing, helping to keep your mind active and preventing you from becoming isolated. Starting the legal process as soon as possible allows for early access to the support and rehabilitation you need to start to rebuild your life. CFG Law exists to help those affected by injuries – together. If you or a loved one has suffered from a serious injury, the first step is to call one of our solicitors on 0800 988 7096 for FREE no obligation advice.